Photo by Reilly Kneedler and Reilly Kneedler | The State Press ASU police officer Colton Adams and his K-9 partner Tillman are photographed near the Memorial Union building on Friday, Nov. 18, 2016. But as those 60,000 fans watched the Sun Devils fall to the Utah Utes, the freshly-introduced ASU Police Officer Colton Adams and his 20-month-old K-9, Tillman, were called into action by Tempe police. The suspect ran from the scene of a vehicle collision and was wanted for felony warrants, Adams said. That’s when the Tempe Police Department called in Adams and Tillman to help with the search. Tillman is a brand-new member of the force and was recently certified as a patrol dog. For now, he specializes in suspect search and apprehension but soon will also be certified in explosive-detection. Named after ASU alumnus, Pat Tillman, the former football player who died in Afghanistan in 2004 after leaving the NFL to enlist in the military, the young German Shepard is also a crowd-pleaser, Adams said. The department selected him from about 30 other German Shepards and Belgian Malinois at a kennel in Pennsylvania, Adams said. Tillman is a play-reward dog, meaning his reward for completing a task is play-time with a toy. But Adams said finding a toy that could hold-out against Tillman’s jaw strength was not easy. The toys were key to keeping the patrol dog’s interest during training, a 10-week course hosted by Tempe Police that taught both Adams and Tillman how to search for suspects and clear buildings and vehicles. Because the K-9 Unit at ASU Police is so small, Tempe Police has taken over the bulk of the training. For Adams, who was born and raised in the Phoenix area, his past experience with animals made the decision to get involved as a K-9 handler an easy one. Adams started at the department in 2011, first as a police-aid and then as a full-fledged patrol officer. He and Tillman will be based on the Tempe campus, but will respond to calls wherever they’re needed, he said. 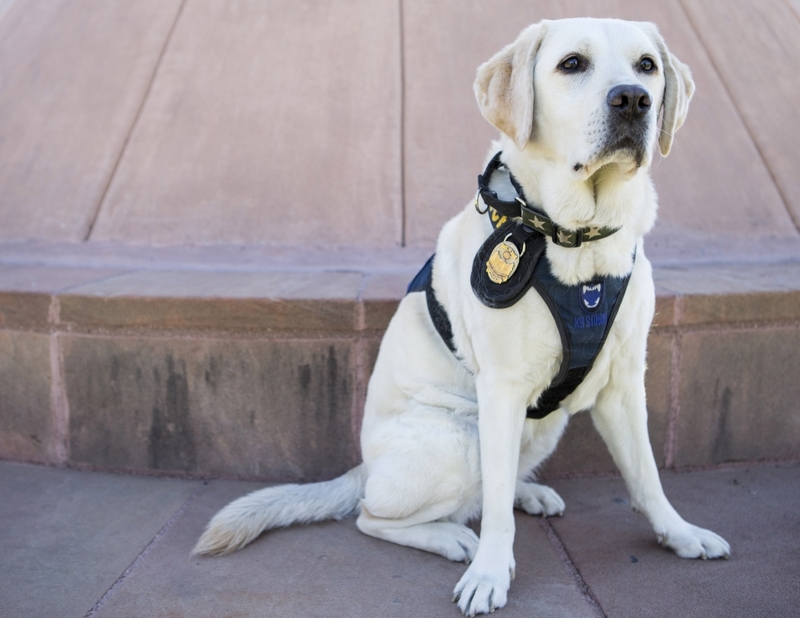 The department currently has one other dog: a lab named Disney who specializes in bomb-detection. Disney was the first K-9 to ever be a member of the department, her handler Detective Parker Dunwoody said. The department made the decision to get Tillman partly because Disney will be retiring soon, Dunwoody said. But Disney helped pave the way for Tillman in more ways than one. 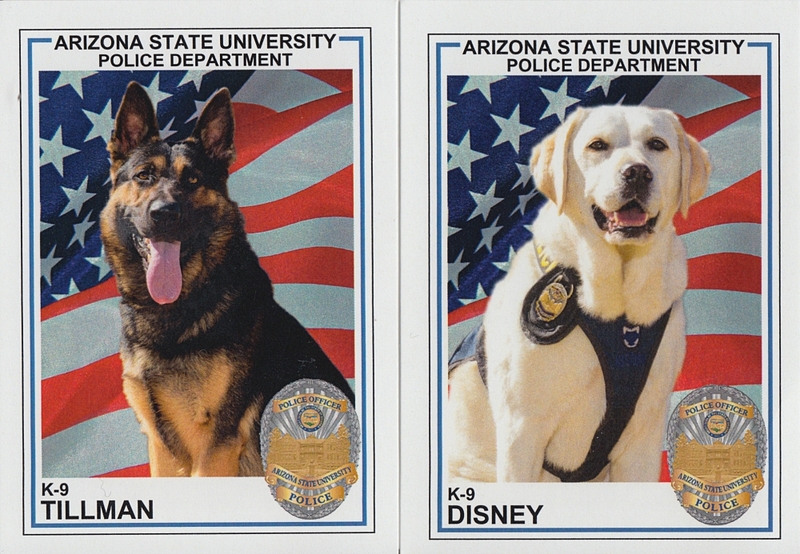 An ASU alumnus named Bob Fisher saw Dunwoody and Disney at an event last year was inspired to make a donation that helped the department purchase Tillman, police department public information officer Katy Harris said. “Fisher died at age 79 in May, but the donations made in his memory will help make the Arizona State University campus a safer place,” Harris said. For officer Adams, even the dog's name, Tillman, is fitting for his new K-9 partner.